14th February 2017 - Vouchers and prizes! Congratulations to our five most recent voucher winners, whose names were drawn from those who completed our Autumn Term RTC survey. Our lucky winners came from Essex, Powys, Suffolk, Co Tyrone and Hampshire, and each of them received a £20 Marks and Spencer voucher. Thank you to everyone who took part in this survey, and please look out for any future Catch Up® surveys – next time, you could be one of our winners! Congratulations to the two schools who won the prize draws on our stands at the Leeds City Council ‘Making Best Use of TAs’ Conference and the ‘Preparing for the 2017 Key Stage 1 and 2 National Tests’ Conference, both held back in November. 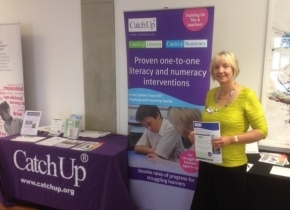 The schools both won a Catch Up® Starter Bundle, which includes 3 training places plus a set of reading books or numeracy apparatus. We look forward to welcoming them on training soon and helping them get started with Catch Up®!